Long-time reader Vixxia Wyrdwritere has sent me a few parcels over the past year packed with some wonderful goodies and thoughtful gifts. 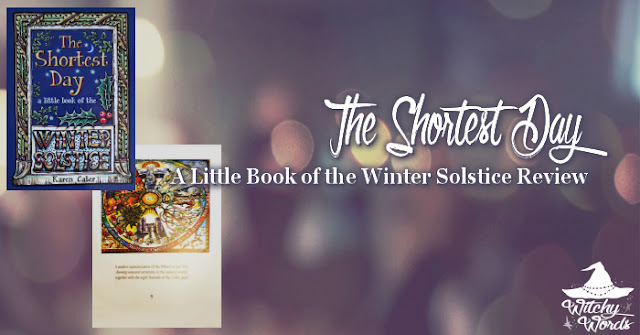 Recently, she sent me a tiny book called The Shortest Day by Karen Cater and asked if I'd review it. I'm always happy to oblige a review, especially when the item is particularly review-worthy! Let's dive in! The Shortest Day is a small book written and illustrated by author Karen Cater. When I received the book, I was surprised at just how small it was - barely the length of my hand. It truly is a little book. But don't let its size fool you; big things come in small packages! This book is chocked full of information about the upcoming holiday. A total of 63 pages, Cater makes the most of her limited space to provide a comprehensive look at the meaning of the solstice. The book begins with a scientific view of Midwinter, explaining the name, the appearance of the sun's stance int he sky and how this cycles every year. Cater then dives into the history of the solstice in Britain by visiting a number of neolithic sacred sites. From the well-known Stonehenge to the village of Avebury, the author pinpoints the role of the solstice at these locations. She continues on to the role of the Mistletoe plant in Yule and rounds the book out with historic customs and how they've evolved over the years. It's surprising just how much information Cater was able to pack into 63 pages. Even I learned something new! While The Shortest Day overflows with information, you can't mention this book without also talking about Cater's fabulous artwork. Bold, colorful prints grace the pages of this tiny book, highlighting new sections and chapters with a peek into the sites and historical lore. Overall, I found The Shortest Day a fascinating read, perfect for the budding Pagan looking for some scientific and historical insight into one of the eight common holidays of the year. The tiny book surprised me with just how much information is stored between its mere 60 pages. Combined with vivid illustrations, this book would make a lovely addition to a Yuletide stocking or gift box this upcoming holiday! It is also Familiar Approved! Click here to purchase The Shortest Day! Click here for more of Karen Cater's work! Being Familiar Approved is a guarantee for a good read! Love Your Article. We actually have a little one-person metaphysical shop online at: https://lightwitchtarotshop.com - Check it out for 100% Positive Reviews and More!